chips, two chips, one chip, and no chips respectively. a. What would it be like to live in a country in each group? 2. Does each country have a large and well-balanced resource base (3 chips of 3 different colors)? b. 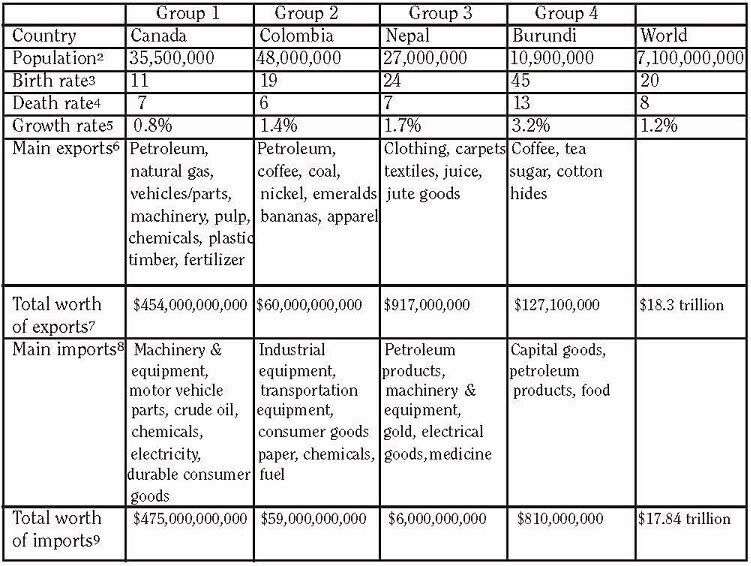 How does Group 1’s ability to export resources affect their wealth and well-being? decrease, or stay the same? Why? 5. What are some possible advantages and disadvantages of having a stable population? 6. You’ll notice that Canada and Colombia export approximately the same amount as they import. However, this isn’t the case with Nepal and Burundi. -How can a country afford to import more than it exports? 7. There is a large difference between the amount that each country’s exports are worth. -Calculate the amount of exports per capita, for each country. 8. How are a country's resources impacted by the size of their population? 9. How are a country’s resources impacted by population growth? -more resources need to be mined/produced/grown in order to provide for more people. -the amount of non-renewable resources will decrease as more people are using them. 10. Compare the growth rates of each country with the population growth rate of the planet.